Tibet Trekking is one of the unforgettable Tibet tours among travelers. Trekking in Tibet is definitely a lifetime experience for those who want to have a fresh feeling about Tibet. 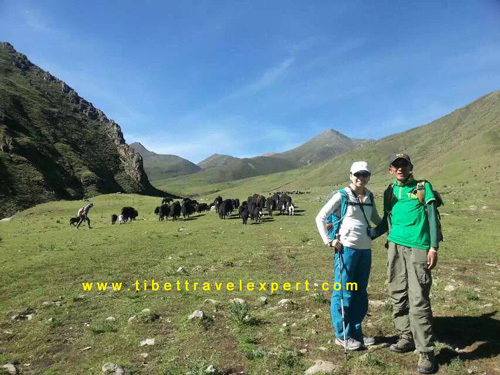 Unlike the Tibet city tour and temple tour, Tibet trekking tour offers the trekkers a natural landscape and stunning views of some untouched wonderlands. Here are some Tibet trekking advice you may need before your Tibet trekking tour. Known as the capital city of Tibet Autonomous Region, Lhasa, is the first stop when most travelers come to Tibet. Four seasons are suitable for trekking in Lhasa. However, from late October to the next March (or we can say winter season) is the low season of Tibet travel. So there are less tourists in Tibet. And it is the best time for traveling and trekking, if you want to experience a different lifestyle in Tibet. But, you do need to bring some warm clothes and be prepare of the cold weather and high altitude. Besides, if you are planning to come to Lhasa in other seasons, then there is great chance that you can enjoy the flourishing grasslands and wild flowers along the way. Worth to mention, summer is supposed to be the rainy season of Tibet, so watch out your steps. 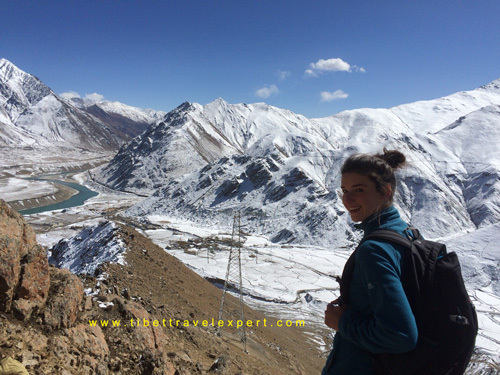 Tips: There are three highlight trekking routes in Lhasa: Tsurphu-Yampachen trekking, Ganden Monastery-Samye Monastery Trekking, Namtso Lake trekking. Shigatse city is the second largest city in Tibet, just after Lhasa. As July and August are the rainy seasons in Shigatse prefecture. Even though it usually rains at night, sunny in the daytime, it is not that good for trekking in bad road condition. Moreover, Everest trekking tour is the most highlight tour in this region. The best time for Everest trekking is April to June and October. Tips: There are 4 highlight trekking routes in Shigatse: Tingri-Everest Base Camp trekking, Everest Advanced Base Camp Trekking, Khata Valley-East Everest Base Camp Trekking, Shalu-Nartang Trekking. Yamdrok Lake trekking is the highlight trekking route in Shannan region. And, the best seasons for this trekking are May, June and September. Meanwhile, this trekking is very suitable for trekking beginners. Because it is a relatively easy trekking tour for 2-3 days trekking and great opportunities to view the holy turquoise Yamdrok Lake. During the trek towards Yamdrok Lake, the primitive natural sceneries along with old monasteries, animals, villages will give trekkers an unprecedented impression on Tibet. The whole trekking tour combines natural sceneries, monastery views and cultural tour together. Therefore, it is very worth taking. Nyingchi has a reputable name of ‘Switzerland of Tibet’ and the ‘Jiangnan of Tibet’. The weather is fine throughout all the seasons of the year. And, the climate and season have little impact for travelling to Nyingchi area. The best seasons to enjoy the stunning landscapes are March to October. Moreover, if you trek in these seasons, you will be embraced by the green valleys and wild flowers along your way. But, July and August are rainy seasons in Tibet. So, there is chance for natural disasters happening in this area, such as landslide, mudslides etc. Kailash pilgrimage trekking is the highlight trekking route in Ngari prefecture. Every year, thousands make a pilgrimage to Kailash for the faith they believed that circumambulating Kailash by foot will bring good luck and clear the sins. The total miles of the Pilgrimage Kora is 53 km. It usually takes about 3 days for normal people or fewer days for local people. What’s more, the best seasons for Mt. Kailash Kora are late May to early September. As well, the July and August are the rainy seasons, so we don’t recommend trekkers to do their trekking in these two period. The best time for trekking in Qamdo prefecture is April to May and September to October. And trekkers can enjoy the fabulous views of mountain, glacier, grassland, lake, and animals. Besides, you can also have an ancient Tea Horse Road Trekking experience. The best time for trekking in Nagchu is from May to September. Because the highlight attraction of Nagchu is grassland and lake views, during these months trekkers can enjoy the golden time of the grassland here. What’s more, if you feel uncomfortable during the trekking, please tell your guide and partner. Acclimatization. Before your trekking tour, you need several days’ acclimatization upon your arrival at Lhasa city. You’d better stay at your hotel and do some easy walking in Lhasa city in the first few days. Experienced local guide. As the trekking place is in remote area of Tibet, you need an experienced Tibetan local guide to lead you. Meanwhile, the guide can help you arrange a reasonable day-trekking miles according to the road condition, weather and your physical condition. Mountain cook. If you and your team are planning a long-term trekking tour in Tibet, you’d better hire a mountain cook with your team. Because you need much food and water to support your trekking. And a mountain cook will prepare delicious and nutritional meals for you with the canned gas. Nevertheless, trekkers also need to bring some dry and easy food as well. Necessary Tibet permits. If you want to travel to Tibet, it’s necessary for foreign travelers to get needed Tibet permits. But, our local Tibet Travel Expert agency will handle all the needed Tibet permits that covers your trekking and traveling in Tibet. So, there is no need to worry about it. Well, you do need to bring your passport with you. Equipment and Medicine. As you may travel to high altitude areas, you should bring some necessary medicines for the AMS. For example, the Aspirin, Diamox and so on. In the meantime, you’d better prepare some necessary equipment like tents, sleeping bags, hiking shoes, sunglasses, oxygen bottles, sunscreen, warm clothes and other washing articles etc. In addition, you can also take a camera for taking amazing pictures and recording those happy moments. Read more about Tibet Trekking Tips and Top 9 Popular Tibet Trekking Trails.